Not sure on my plans yet..
I’ll be there Sunday for sure, and may be able to take off Monday and head to Indy. We’ll be at the Chicago event and probably the drive to Indy, maybe as far as KC. Do you think MINI will ask for local advice? Remember the fiasco of a drive from Lincoln Park to RA? Our club info has already been submitted, and we have been in contact with MINIUSA. The Chicago leg of the route will be led by Gabe Bridger from Motoringfile and former CMMC club president, so we should be in good hands. 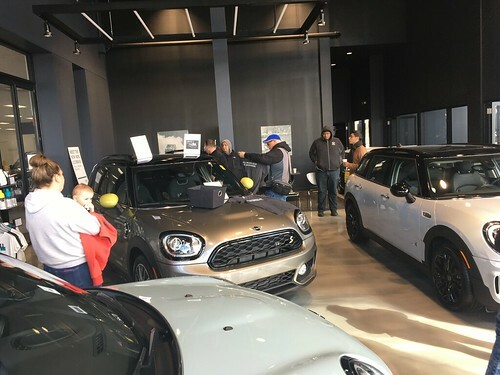 The Milwaukee MINIS are thinking about departing on August 10th or 11th and driving to Kansas City. We can stop in Chicago to pick up anyone else that wants to skip the Indy & St. Louis legs. Thoughts? I might be interested in the drive to Kansas City. Not sure about Indy/St. Louis. I’m now looking to do a day trip to Indy and planning on heading home Monday evening. I am interested in a day trip to Indy returning home on Monday. I’m in for Sunday night. Plus one. Can’t wait to see everyone. I’m doing the entire thing. I registered for 10am. Let’s organize a meet at least in the Chicago location? I am tempted to take a longer drive too..
I’m signed up for the 9am MINIcross time slot.. They will be doing about 50 people an hour. I’ll hang around for a while afterwards (and definitely see you go through it), but I don’t think I will be there all Sunday..
Don’t know how things will be organized, but since I know you will be there I’ll keep my eyes open for you. I’m signed up for the 11am MINICross. We decided to to Minis in the Mountains, since it includes MTTS registration, so we’ll be skipping the MTTS rally and leaving Wednesday for Denver. From there we’ll take the long way home, via Mt. Rushmore (thanks for the idea, Steve). I registered for the 11:00 MiniCross. Carolyn and I plan to stay to check out the Countryman that night. I doubt I drive to Indy on Monday. I’ve driven I-65 a ton ‘o times and it’s not so exciting. Not like a Rally on back roads. Or am I missing something?…. I’ve driven I-65 a ton ‘o times and it’s not so exciting. Not like a Rally on back roads. Or am I missing something?…. I believe the plan is to take I-65, but there may be an alternate route as well.. 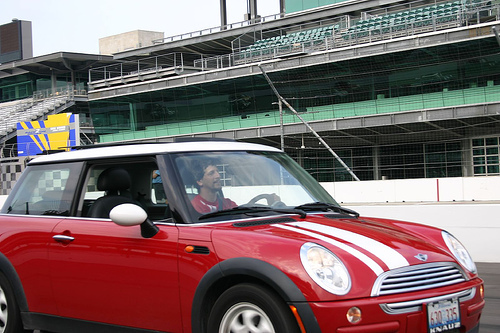 I also plan on the drive to Indy to do the lap at the track I have attended 21 straight years, but have never done a lap on. May drive home Monday night, may stay. By the way, is there any reason/need to register for MTTS if you are not going to Denver? Once you register for MINIcross it wouldn’t let me register for MTTS using the same email. But I used my other email! The Monday day trip sounds interesting. I will be in Chicago on Sunday too. If there are any detials about the Monday meet up would they be posted here or by MTTS? If there are any details about the Monday meet up would they be posted here or by MTTS? The official details are in the PDF that is linked above on this post. The route is included in there. I am debating skipping the Skyway portion of the beginning of the route, but I haven’t made up my mind yet (bring an I-Pass just in case). I’ll be packing an FRS radio tuned to Channel#1, subchannel#1. Guessing Jim will also have his. Steve i’am register for the minicross at 1 pm. But i did not resgister for the MTTS.I see you told LTLMCPE that they want us to.I’am takeing my son with me,do I have to register him to.Also is the tickets to see the new countryman Friday night or is it Sunday night. do I have to register him to.Also is the tickets to see the new countryman Friday night or is it Sunday night. The MINICross is free, everything else they would like you to register. The Countryman will be at the Sunday night event. I see you’ve got 2 of the free tickets from the MINIUSA special deal on the other post so you should be good! !